Todd Glass is Managing Director of Investments of Humphreys Capital. In this role, he carries out investment activities, including sourcing, underwriting, and recommending investments and dispositions to the Investment Committee. Todd currently serves as the chair of the Oklahoma District Council of the Urban Land Institute and on the Small-Scale Development Council for ULI. Todd’s 16 years of experience have uniquely equipped him to be a real estate investor. After law school, Todd began his career in commercial real estate brokerage at Price Edwards & Company, and later he became the Assistant Vice President at MidFirst Bank. 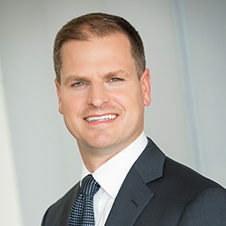 Todd then served as Director of Real Estate for Devon Energy where he managed over 2 million square feet of real estate and assisted in the development of Devon’s one million square-foot headquarters building in Oklahoma City. He joined Humphreys Capital in 2013. Todd earned a Juris Doctor from The University of Oklahoma in 2002 and a Bachelor of Arts from The University of Oklahoma in 1999. He and his wife, Kelli, have three children and live in Oklahoma City.